The bringing into existence of the world by the act of God. Most Jewish philosophers find in (Gen. i. 1) creation ex nihilo ( ). The etymological meaning of the verb , however, is "to cut out and put into shape," and thus presupposes the use of material. This fact was recognized by Ibn Ezra and Naḥmanides, for instance (commentaries on Gen. i. 1; see also Maimonides, "Moreh Nebukim," ii. 30), and constitutes one of the arguments in the discussion of the problem. 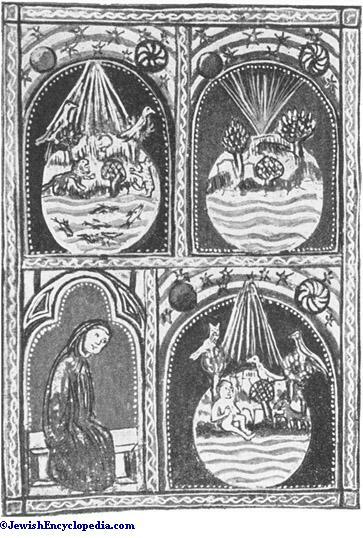 Whatever may be the nature of the traditions in Genesis (see Cosmogony), and however strong may be the presumption that they suggest the existence of an original substance which was reshaped in accordance with the Deity's purposes (see Dragon; Darkness), it is clear that the Prophets and many of the Psalms accept without reservation the doctrine of creation from nothing by the will of a supermundane personal God (Ps. xxxiii. 6-9, cii. 26, cxxi. 2; Jer. x. 12; Isa. xlii. 5, xlv. 7-9): "By the word of the Lord were the heavens made; and all the host of them by the breath of his mouth." To such a degree has this found acceptance as the doctrine of the Synagogue that God has come to be desinated as "He who spake and the world sprang into existence" (see Baruk She-Amar and 'Er. 13b; Meg. 13b; Sanh. 19a, 105a; Ḥid. 31a; Ḥul. 63b, 84b; Sifre to Num. § 84; Gen. R. 34b; Ex. R. xxv. ; Shab. 139a; Midrash Mishle, 10c). God is "the author of creation," ("bereshit" having become the technical term for "creation"; Gen. R. xvi. ; Ber. 54a, 58a; Ḥag. 12a, 18a; Ḥul. 83a; Ecclus. [Sirach] xv. 14). The belief in God as the author of creation ranks first among the thirteen fundamentals (see Articles of Faith) enumerated by Maimonides. It occurs in the Yigdal, where God is called , "anterior [because Himself uncreated] to all that was created "; in the Adon 'Olam; and it is taught in all modern Jewish catechisms. 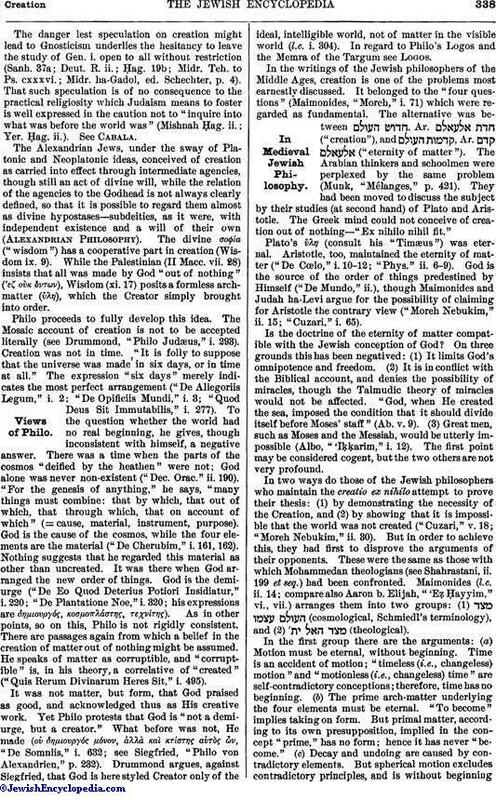 Nevertheless, Jewish literature (Talmudic, pseudoepigraphic, and philosophical) shows that the difficulties involved in this assumption of a creation ex nihilo ( ) and in time, were recognized at a very early day, and that there were many among the Jews who spoke out on this subject with perfect candor and freedom. Around the first chapter of Genesis was waged many a controversy with both fellow Jews and non-Jews. 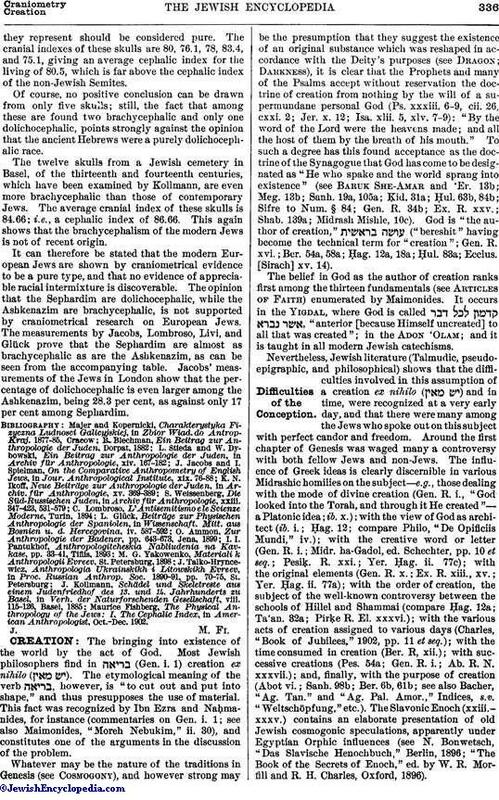 The influence of Greek ideas is clearly discernible in various Midrashic homilies on the subject—e.g., those dealing with the mode of divine creation (Gen. R. i., "God looked into the Torah, and through it He created"—a Platonic idea; ib. x. ); with the view of God as architect (ib. i.; Ḥag. 12; compare Philo, "De Opificiis Mundi," iv. ); with the creative word or letter (Gen. R. i.; Midr. ha-Gadol, ed. Schechter, pp. 10 et seq. ; Pesiḳ. R. xxi. ; Yer. Ḥag. ii. 77c); with the original elements (Gen. R. x.; Ex. R. xiii., xv. ; Yer. Ḥag. ii. 77a); with the order of creation, the subject of the well-known controversy between the schools of Hillel and Shammai (compare Ḥag. 12a; Taan. 32a; Pirḳe R. El. xxxvi. ); with the various acts of creation assigned to various days (Charles, "Book of Jubilees," 1902, pp. 11 et seq. ); with the time consumed in creation (Ber. R, xii. ); with successive creations (Pes. 54a; Gen. R. i.; Ab. R. N. xxxvii. ); and, finally, with the purpose of creation (Abot vi. ; Sanh. 98b; Ber. 6b, 61b; see also Bacher, "Ag. Tan." and "Ag. Pal. Amor.," Indices, s.v. "Weltschöpfung," etc.). The Slavonic Enoch (xxiii.-xxxv.) 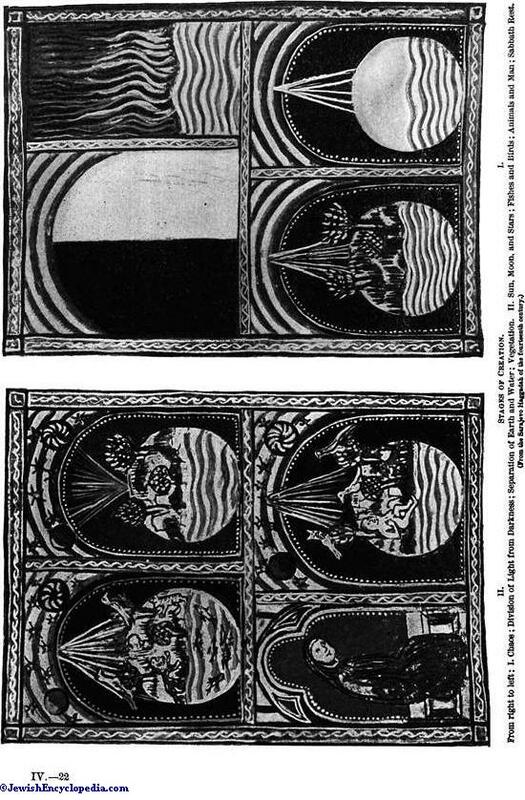 contains an elaborate presentation of old Jewish cosmogonic speculations, apparently under Egyptian Orphic influences (see N. Bonwetsch, "Das Slavische Henochbuch," Berlin, 1896; "The Book of the Secrets of Enoch," ed. by W. R. Morfill and R. H. Charles, Oxford, 1896). From right to left: I. Chaos; Division of Light from Darkness; Separation of Earth and Water; Vegetaion. II. Sun, Moon, and Stars; Fishes and Birds; Animals and Man; Sabbath Rest. The danger lest speculation on creation might lead to Gnosticism underlies the hesitancy to leave the study of Gen. i. open to all without restriction (Sanh. 37a; Deut. R. ii. ; Ḥag. 19b; Midr. Teh. to Ps. cxxxvi. ; Midr. ha-Gadol, ed. Schechter, p. 4). That such speculation is of no consequence to the practical religiosity which Judaism means to foster is well expressed in the caution not to "inquire into what was before the world was" (Mishnah Ḥag. ii. ; Yer. Ḥag. ii.). See Cabala. The Alexandrian Jews, under the sway of Platonic and Neoplatonic ideas, conceived of creation as carried into effect through intermediate agencies, though still an act of divine will, while the relation of the agencies to the Godhead is not always clearly defined, so that it is possible to regard them almost as divine hypostases—subdeities, as it were, with independent existence and a will of their own (Alexandrian Philosophy). The divine σοΦΊα ("wisdom") has a cooperative part in creation (Wisdom ix. 9). While the Palestinian (II Macc. vii. 28) insists that all was made by God "out of nothing" (ἐζ οὴκ ὄντων), Wisdom (xi. 17) posits a formless archmatter (ὔλη), which the Creator simply brought into order. Philo proceeds to fully develop this idea. The Mosaic account of creation is not to be accepted literally (see Drummond, "Philo Judæus," i. 293). Creation was not in time. "It is folly to suppose that the universe was made in six days, or in time at all." The expression "six days" merely indicates the most perfect arrangement ("De Allegoriis Legum," i. 2: "De Opificiis Mundi," i. 3; "Quod Deus Sit Immutabilis," i. 277). To the question whether the world had no real beginning, he gives, though inconsistent with himself, a negative answer. There was a time when the parts of the cosmos "deified by the heathen" were not; God alone was never non-existent ("Dec. Orac." ii. 190). "For the genesis of anything," he says, "many things must combine: that by which, that out of which, that through which, that on account of which" (= cause, material, instrument, purpose). God is the cause of the cosmos, while the four elements are the material ("De Cherubim," i. 161, 162). Nothing suggests that he regarded this material as other than uncreated. It was there when God arranged the new order of things. God is the demiurge ("De Eo Quod Deterius Potiori Insidiatur," i. 220; "De Plantatione Noe," i. 320; his expressions are δημιουργός, κοσμπλάστης, τεχνἰτης). As in other points, so on this, Philo is not rigidly consistent. There are passages again from which a belief in the creation of matter out of nothing might be assumed. He speaks of matter as corruptible, and "corruptible" is, in his theory, a correlative of "created" ("Quis Rerum Divinarum Heres Sit," i. 495). It was not matter, but form, that God praised as good, and acknowledged thus as His creative work. Yet Philo protests that God is "not a demiurge, but a creator." What before was not, He made (οὐ δημιουργός μόνον, ἀλλὰ καὶ κτίστης αὐτὸς ὠν, "De Somniis," i. 632; see Siegfried, "Philo von Alexandrien," p. 232). Drummond argues, against Siegfried, that God is here styled Creator only of the ideal, intelligible world, not of matter in the visible world (l.c. i. 304). In regard to Philo's Logos and the Memra of the Targum see Logos. In the writings of the Jewish philosophers of the Middle Ages, creation is one of the problems most earnestly discussed. It belonged to the "four questions" (Maimonides, "Moreh," i. 71) which were regarded as fundamental. The alternative was between , Ar. ("creation"), and Ar. ("eternity of matter"). The Arabian thinkers and schoolmen were perplexed by the same problem (Munk, "Mélanges," p. 421). They had been moved to discuss the subject by their studies (at second hand) of Plato and Aristotle. The Greek mind could not conceive of creation out of nothing—" Ex nihilo nihil fit." Plato's ὕλη (consult his "Timæus") was eternal. Aristotle, too, maintained the eternity of matter ("De Cœlo," i. 10-12; "Phys." ii. 6-9). God is the source of the order of things predestined by Himself ("De Mundo," ii. ), though Maimonides and Judah ha-Levi argue for the possibility of claiming for Aristotle the contrary view ("Moreh Nebukim," ii. 15; "Cuzari," i. 65). Is the doctrine of the eternity of matter compatible with the Jewish conception of God? On three grounds this has been negatived: (1) It limits God's omnipotence and freedom. (2) It is in conflict with the Biblical account, and denies the possibility of miracles, though the Talmudic theory of miracles would not be affected. "God, when He created the sea, imposed the condition that it should divide itself before Moses' staff" (Ab. v. 9). (3) Great men, such as Moses and the Messiah, would be utterly impossible (Albo, "'Iḳḳarim," i. 12). The first point may be considered cogent, but the two others are not very profound. In two ways do those of the Jewish philosophers who maintain the creatio ex nihilo attempt to prove their thesis: (1) by demonstrating the necessity of the Creation, and (2) by showing that it is impossible that the world was not created ("Cuzari," v. 18; "Moreh Nebukim," ii. 30). But in order to achieve this, they had first to disprove the arguments of their opponents. These were the same as those with which Mohammedan theologians (see Shahrastani, ii. 199 et seq.) had been confronted. Maimonides (l.c. ii. 14; compare also Aaron b. Elijah, "'Eẓ Ḥayyim," vi., vii.) arranges them into two groups: (1) (cosmological, Schmiedl's terminology), and (2) (theological). In the first group there are the arguments: (a) Motion must be eternal, without beginning. Time is an accident of motion; "timeless (i.e., changeless) motion" and "motionless (i.e., changeless) time" are self-contradictory conceptions; therefore, time has no beginning. 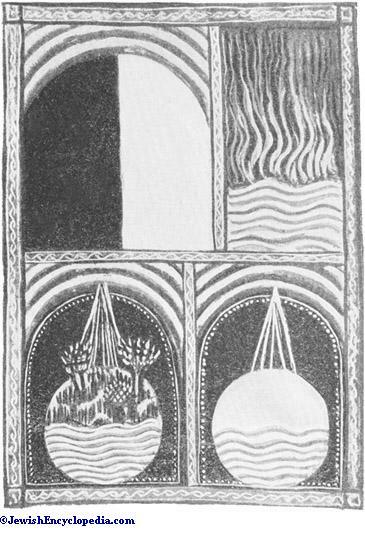 (b) The prime arch-matter underlying the four elements must be eternal. "To become" implies taking on form. But primal matter, according to its own presupposition, implied in the concept "prime," has no form; hence it has never "become." (c) Decay and undoing are caused by contradictory elements. But spherical motion excludes contradictory principles, and is without beginningand end. (d) Suppose the world had a beginning; then either its creation was necessary—that is, eternal—or its previous existence was impossible (and thus it might not be now); but if it was possible, then possibility (potentiality) presupposes a subject carrying attributes involving the possibility. This subject could not but be eternal. In the second group there are the arguments (a) God could not have been a creator in potentia without suffering change in Himself from potentia to reality. What caused this change? (b) The world created in time presupposes some exciting cause for God's will to create. Either God did not previously will to create, or, if He did, He had not the power. The world can not be thought eternal unless we admit defects in God. (c) The world is perfect, the product of God's wisdom. God's wisdom and His essence are coincident. God being eternal, His work must also be eternal. (d) What did God do before the world was? How did Jewish thinkers meet these positions? They followed in the paths of the Arab Motekallamin. Especially did they lay emphasis on the proof of free determination," which the Arabic logicians had developed ( , Ar. "al-takhṣiṣ"). Admitting no "law of nature," they posited the principle of limitless possibility. Things are as they are, not because they must be so, but because a free Being outside of them wills them to be so. He might also have willed them to be otherwise. He who determines is also He who creates; that is, produces from nothing. The world is as it is because a Being determined its being, preferring its being to its non-being. Matter dependent for form upon another, even if eternal, can not exist. God is by inherent necessity. The fact that matter is as it is, shows that it was created to be as it is by the preference of the Creator. In historical succession Saadia was the first to take up the problem, especially in his "Emunot" (i. 1-5). He argues for the creation from the irrationality of an endless limitless quantity—a favorite theme among the Motekallamin. His argumentation is extremely obscure. 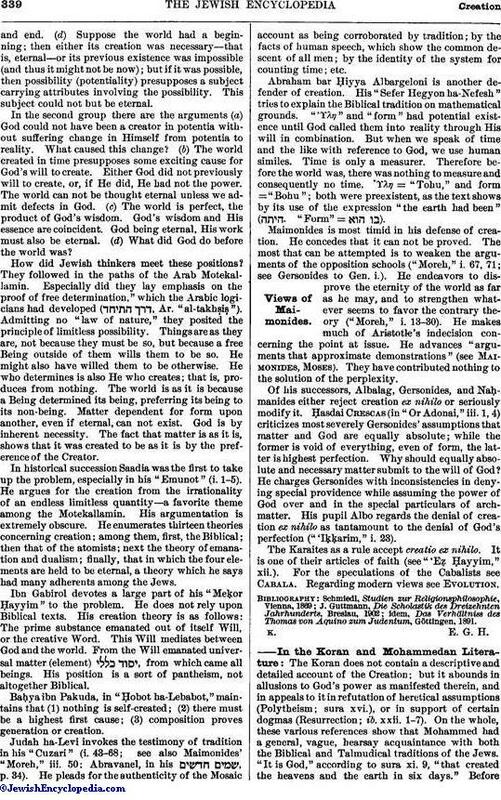 He enumerates thirteen theories concerning creation; among them, first, the Biblical; then that of the atomists; next the theory of emanation and dualism; finally, that in which the four elements are held to be eternal, a theory which he says had many adherents among the Jews. Ibn Gabirol devotes a large part of his "Meḳor Ḥayyim" to the problem. He does not rely upon Biblical texts. His creation theory is as follows: The prime substance emanated out of itself Will, or the creative Word. This Will mediates between God and the world. From the Will emanated universal matter (element) , from which came all beings. His position is a sort of pantheism, not altogether Biblical. Baḥyaibn Pakuda, in "Ḥobot ha-Lebabot," maintains that (1) nothing is self-created; (2) there must be a highest first cause; (3) composition proves generation or creation. Judah ha-Levi invokes the testimony of tradition in his "Cuzari" (i. 43-68; see also Maimonides' "Moreh," iii. 50; Abravanel, in his , p. 34). He pleads for the authenticity of the Mosaic account as being corroborated by tradition; by the facts of human speech, which show the common descent of all men; by the identity of the system for counting time; etc. Abraham bar Ḥiyya Albargeloni is another defender of creation. His "Sefer Hegyon ha-Nefesh" tries to explain the Biblical tradition on mathematical grounds. "Γλη" and "form" had potential existence until God called them into reality through His will in combination. But when we speak of time and the like with reference to God, we use human similes. Time is only a measurer. Therefore before the world was, there was nothing to measure and consequently no time. Γλη = "Tohu," and form = "Bohu"; both were preexistent, as the text shows by its use of the expression "the earth had been" ( "Form" = ). Maimonides is most timid in his defense of creation. He concedes that it can not be proved. The most that can be attempted is to weaken the arguments of the opposition schools ("Moreh," i. 67, 71; see Gersonides to Gen. i.). He endeavors to disprove the eternity of the world as far as he may, and to strengthen whatever seems to favor the contrary theory ("Moreh," i. 13-30). He makes much of Aristotle's indecision concerning the point at issue. He advances "arguments that approximate demonstrations" (see Maimonides, Moses). They have contributed nothing to the solution of the perplexity. Of his successors, Albalag, Gersonides, and Naḥmanides either reject creation ex nihilo or seriously modify it. Ḥasdai Crescas (in "Or Adonai," iii. 1, 4) criticizes most severely Gersonides' assumptions that matter and God are equally absolute; while the former is void of everything, even of form, the latter is highest perfection. Why should equally absolute and necessary matter submit to the will of God? He charges Gersonides with inconsistencies in denying special providence while assuming the power of God over and in the special particulars of archmatter. His pupil Albo regards the denial of creation ex nihilo as tantamount to the denial of God's perfection ("'Iḳḳarim," i. 23). The Karaites as a rule accept creatio ex nihilo. It is one of their articles of faith (see "'Eẓ Ḥayyim," xii.). For the speculations of the Cabalists see Cabala. Regarding modern views see Evolution. idem, Das Verhältniss des Thomas von Aquino zum Judentum, Göttingen, 1891. The Koran does not contain a descriptive and detailed account of the Creation; but it abounds in allusions to God's power as manifested therein, and in appeals to it in refutation of heretical assumptions (Polytheism; sura xvi. ), or in support of certain dogmas (Resurrection; ib. xxii. 1-7). On the whole, these various references show that Mohammed had a general, vague, hearsay acquaintance with both the Biblical and Talmudical traditions of the Jews. "It is God," according to sura xi. 9, "that created the heavens and the earth in six days." Beforecreation "His throne [compare ] was upon the water" (see Gen. i. 2; suras 1. 37, lvii. 4). Special emphasis is laid on the forming of the mountains, which are said to give stability to the earth (suras xxi. 22, xxxi. 9, xli. 9. lxxviii. 6). In this a reminiscence of the Biblical (Deut. xxxiii. 27; compare Ps. xc. 2) is suggested, while the popular conceit of the Arabs has it that the earth, when first created, was smooth and flat, which induced the angels to ask who could stand on so tottering a frame. 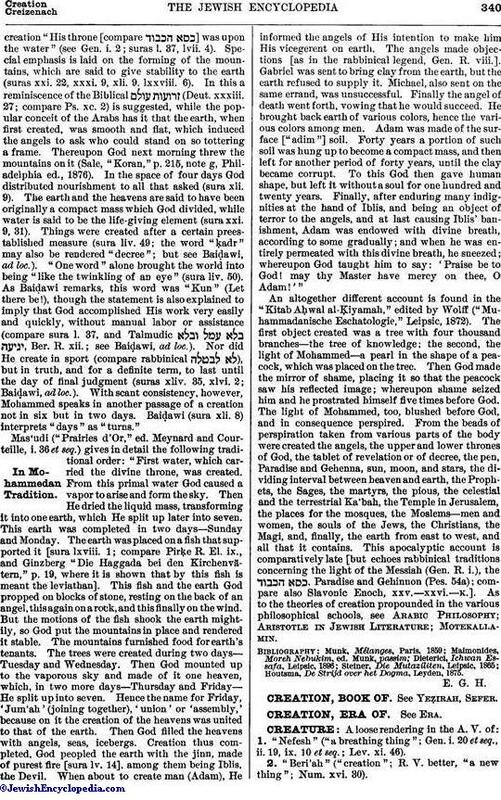 Thereupon God next morning threw the mountains on it (Sale, "Koran," p. 215, note g, Philadelphia ed., 1876). In the space of four days God distributed nourishment to all that asked (sura xli. 9). The earth and the heavens are said to have been originally a compact mass which God divided, while water is said to be the life-giving element (sura xxi. 9, 31). Things were created after a certain preestablished measure (sura liv. 49; the word "ḳadr" may also be rendered "decree"; but see Baiḍawi, ad loc.). "One word" alone brought the world into being "like the twinkling of an eye" (sura liv. 50). As Baiḍawi remarks, this word was "Kun" (Let there be! ), though the statement is also explained to imply that God accomplished His work very easily and quickly, without manual labor or assistance (compare sura l. 37, and Talmudic , Ber. R. xii. ; see Baiḍawi, ad loc.). Nor did He create in sport (compare rabbinical ), but in truth, and for a definite term, to last until the day of final judgment (suras xliv. 35, xlvi. 2; Baiḍawi, ad loc.). With scant consistency, however, Mohammed speaks in another passage of a creation not in six but in two days. Baiḍawi (sura xli. 8) interprets "days" as "turns." Mas'udi ("Prairies d'Or," ed. Meynard and Courteille, i. 36 et seq.) gives in detail the following traditional order: "First water, which carried the divine throne, was created. From this primal water God caused a vapor to arise and form the sky. Then He dried the liquid mass, transforming it into one earth, which He split up later into seven. This earth was completed in two days—Sunday and Monday. The earth was placed on a fish that supported it [sura lxviii. 1; compare Pirḳe R. El. ix., and Ginzberg "Die Haggada bei den Kirchenvätern," p. 19, where it is shown that by this fish is meant the leviathan]. This fish and the earth God propped on blocks of stone, resting on the back of an angel, this again on a rock, and this finally on the wind. But the motions of the fish shook the earth mightily, so God put the mountains in place and rendered it stable. The mountains furnished food for earth's tenants. The trees were created during two days—Tuesday and Wednesday. Then God mounted up to the vaporous sky and made of it one heaven, which, in two more days—Thursday and Friday—He split up into seven. Hence the name for Friday, 'Jum'ah, (joining together), 'union' or 'assembly,' because on it the creation of the heavens was united to that of the earth. Then God filled the heavens with angels, seas, icebergs. Creation thus completed, God peopled the earth with the jinn, made of purest fire [sura lv. 14], among them being Iblis, the Devil. When about to create man (Adam), He informed the angels of His intention to make him His vicegerent on earth. The angels made objections [as in the rabbinical legend, Gen. R. viii.]. Gabriel was sent to bring clay from the earth, but the earth refused to supply it. Michael, also sent on the same errand, was unsuccessful. Finally the angel of death went forth, vowing that he would succeed. He brought back earth of various colors, hence the various colors among men. Adam was made of the surface ["adim"] soil. Forty years a portion of such soil was hung up to become a compact mass, and then left for another period of forty years, until the clay became corrupt. To this God then gave human shape, but left it without a soul for one hundred and twenty years. Finally, after enduring many indignities at the hand of Iblis, and being an object of terror to the angels, and at last causing Iblis' banishment, Adam was endowed with divine breath, according to some gradually; and when he was entirely permeated with this divine breath, he sneezed; whereupon God taught him to say: 'Praise be to God! may thy Master have mercy on thee, O Adam!'" An altogether different account is found in the "Kitab Aḥwal al-Ḳiyamah," edited by Wolff ("Muhammadanische Eschatologie," Leipsic, 1872). The first object created was a tree with four thousand branches—the tree of knowledge; the second, the light of Mohammed—a pearl in the shape of a peacock, which was placed on the tree. Then God made the mirror of shame, placing it so that the peacock saw his reflected image; whereupon shame seized him and he prostrated himself five times before God. The light of Mohammed, too, blushed before God, and in consequence perspired. From the beads of perspiration taken from various parts of the body were created the angels, the upper and lower thrones of God, the tablet of revelation or of decree, the pen, Paradise and Gehenna, sun, moon, and stars, the dividing interval between heaven and earth, the Prophets, the Sages, the martyrs, the pious, the celestial and the terrestrial Ka'bah, the Temple in Jerusalem, the places for the mosques, the Moslems—men and women, the souls of the Jews, the Christians, the Magi, and, finally, the earth from east to west, and all that it contains. This apocalyptic account is comparatively late [but echoes rabbinical traditions concerning the light of the Messiah (Gen. R. i. ), the . Paradise and Gehinnon (Pes. 54a); compare also Slavonic Enoch, xxv.—xxvi.—K.]. As to the theories of creation propounded in the various philosophical schools, see Arabic Philosophy; Aristotle in Jewish Literature; Motekallamin. Houtsma, De Strijd over het Dogma, Leyden, 1875.